I liked Annie96 too. You should move a bit away from the exactly lines in some cases. I like the style. I agree that I leaned a bit to hard on my inspiration. Then again this was made for a competition in a very short timespan and under a strict word limit. I'm pretty sure that was supposed to happen, I got it too. Sort of like a game-crash ending. Hi! Let me just say that holy crap, this game gave me intense chills. I kept looking over my shoulder, getting lost into this game, feeling like someone was watching me. I loved the whole Chat Room horror/thriller theme as well as the vibes. The only downside I have is that it felt too short and every choice lead to one outcome. There’s always the future, right? Because I have a feeling you may make more games like this (hopefully) in the future. Keep doing what you’re doing because you’re doing really well! id this like a spooky devian art? Reminds me of that Creepypasta called Annie is typing. Hello there. This game overall was quite good and I hope that multiple endings could have been implemented and maybe the story could have lasted slightly longer that it is now. Nooiiice! Liked it a lot. What a spoopy and creepy game to play during the Halloween season! I love the error at the end, Did you set that up or is my computer crappy? Lol oh okay. That makes sense. Cool and gave me the creeps! It heavily reminds me of annie96, and if it's inspired by it then you did a good job. Though, I would have to say that giving choices to the player is nice and has more interaction with the game, it is a bit disappointing that the choices don't really matter in the end. 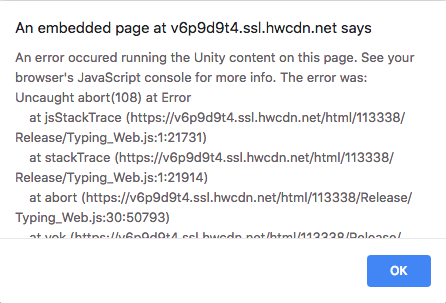 Was Unity supposed to "crash" or is that a real crash? I got so scared that I literally slammed my laptop shut and got up from my chair at the end before I could let the game crash on its own. Neat idea. Bit too short to ever amount to anything, though. OMG HOW DID IT KNOW I WAS PORNING?!?!? !